Maintain perfect temperature control when you use the Winco APSK-730DC Stainless Steel Lined Decaf Airpot with Lever Top 3.0 Liter. Designed with a double wall interior, it keeps beverages hot for extended periods; 171° F for 10 hours and 147° F for 24 hours. In addition, it has a stainless steel structure that is tarnish-proof and its satin finish gives it a freshly polished look. 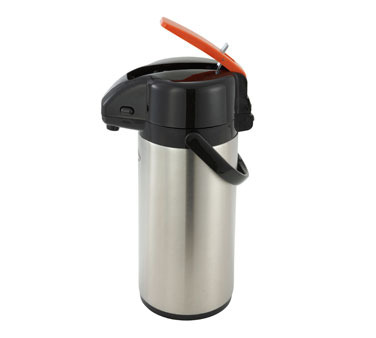 This airpot has an easy to operate lever that provides a steady and controlled flow, while its orange color classifies it as a decaf pot. As an added benefit, it has a swivel base so it can turn full circle offering convenient access from any angle. Use it in your busy hotel or restaurant to be sure that your beverages stay hot throughout the day.